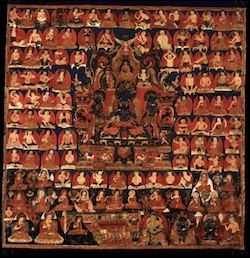 Eighty-four mahasiddhas (Skt. caturaśītisiddha; Tib. གྲུབ་ཐོབ་བརྒྱད་ཅུ་རྩ་བཞི་, drup top gyé chu tsa zhi, Wyl. grub thob brgyad cu rtsa bzhi) — eighty (or eighty four) great siddhas of ancient India whose lives have been recounted by Abhayadatta. Abhayadatta, Buddha's Lions: Lives of the Eighty-four Siddhas, translated by James B. Robinson (Emeryville: Dharma Publishing, 1979).